What would you do with your last day on earth? Smell the roses? – you know what they smell like! Watch the sunset? – they all look the same anyway! Visit your loved ones? – you’ve seen them plenty! Well finally there’s another option – seeing Last Day on Earth perform improv! Fresh from their successful run as the house team for the Bristol based monthly show Parent’s Basement, Last Day on Earth bring an intense, high-energy show, that teeters on the magical line between genius and insanity. Through a series of improvised sketches starting out from a single event, they explore the bizarre lives, quirks and intersections that bring their cast of undoubtedly oddball characters together. For some of whom it may be their Last Day on Earth*! 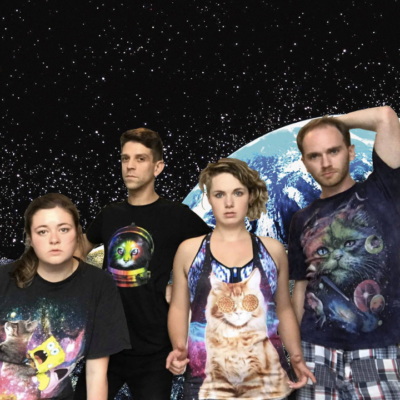 Surreal improvised theatre from a local collective of humans who bond over the odd, the absurd and, most importantly: cats on T-Shirts.